While researching the Dutch influence on NY, I was able to take in some of the local scenery and ask citizens of Amsterdam, NY what they thought about Amsterdam, the one in the Netherlands. This is the story of my role-play as a journalist and addresses the image of ‘Amsterdam’ – to many who are living the American dream it is the land of milk and tourist honey. Does anyone know where it is (Amsterdam, the Netherlands), let alone, care about what goes on there? 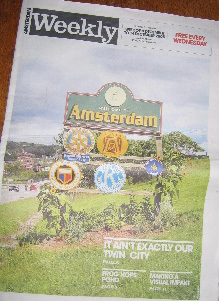 Amsterdam Weekly is an English independent newpaper published in Amsterdam, the Netherlands, providing an insight into the cultural, political and social life of the city.